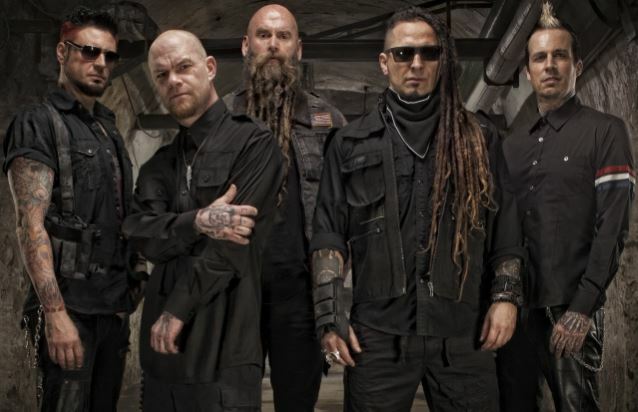 MetalRockNews: Five Finger Death Punch's Jason Hook: "I have ideas for another three or four albums"
Five Finger Death Punch's Jason Hook: "I have ideas for another three or four albums"
Five Finger Death Punch guitarist Jason Hook was recently interviewed by 93.1 The Fox Rocks, you can read some excerpts below. About constantly working on new music, he said: "I have ideas for easily probably another three or four albums on a hard drive. I remember back in the early days, we were on our second record, and I just remember not being very prepared for it. And we only had X amount of months to do a new record, and everyone sort of sitting around going, 'What do you got?' And I'm, like, 'I have nothing. What do you got?' And I just remember thinking, I just don't really wanna have that happen again. Good records have to have good songs, so the more we have to sift through on Day One, the better. So I just figure, okay, the way to approach this is to always have a big variety of stuff to sift through." About his favorite Five Finger Death Punch song to play: "I like… probably either 'Wrong Side Of Heaven' or 'Battle Born'. There's a moment where I get to sit on a stool and play my acoustic guitar by myself with Ivan Moody. And that's kind of really where you put your money where your mouth is. If you can't sit there and play your own song, by yourself, in front of twenty thousand people… I mean, that's kind of what separates the men from the boys, I think. So that's kind of an intimate, cool moment." About playing in front of huge crowds: "Yeah, I mean, all bands have that fantasy of, 'Boy, I would love to be a headliner in a a sold-out arena' context. So I try to… You know, when we're walking to the stage and you see that crowd, your name's on the ticket. I try to never forget that — the fact that we all have that desire as younger kids. So I try to enjoy it, keep your eyes open and absorb it. There's always that moment on stage where you're kind of looking at… I'm looking at Ivan and I'm looking out there. I'm, like, 'Wow! All these people care about what we're doing.' It's really hard to get that level. So I try to remind myself to never get complacent with that."